TELUGU (70m speakers in Andhra Pradesh, SE India. Telugu script is similar to Tamil). 3. The Holy Spirit Power or Person? (Mike Bull) Parishuddhatma shakthiya leda vyaktha? 6. After Death What? (CMPA Pearce) Maranamu tharuvaatha emiti? 7. One God or Trinity- (James and Deb Flint) Devudu okkada leka thrithvama? 10. Why Baptism Really Matters-(CMPA Fred Pearce) Baptismamu enduku pramukhyamainadi? 17. Jesus Christ Man or God? (?) 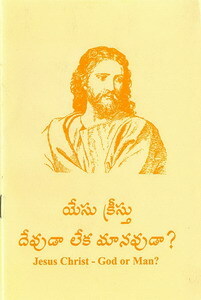 Yesu Christoo manavuda leka devuda?